If you’ve ever had the pleasure of visiting our office, you’ve probably noticed that we’re not your average beige cubicles, stuffy conference rooms kind of place. In fact, one of the first things people notice when they walk in is our velvet fluorescent green couch. It’s practically a BCP landmark. We pride ourselves on creating a fun, energetic office atmosphere where creativity can thrive and our creative team and clients can feel right at home. 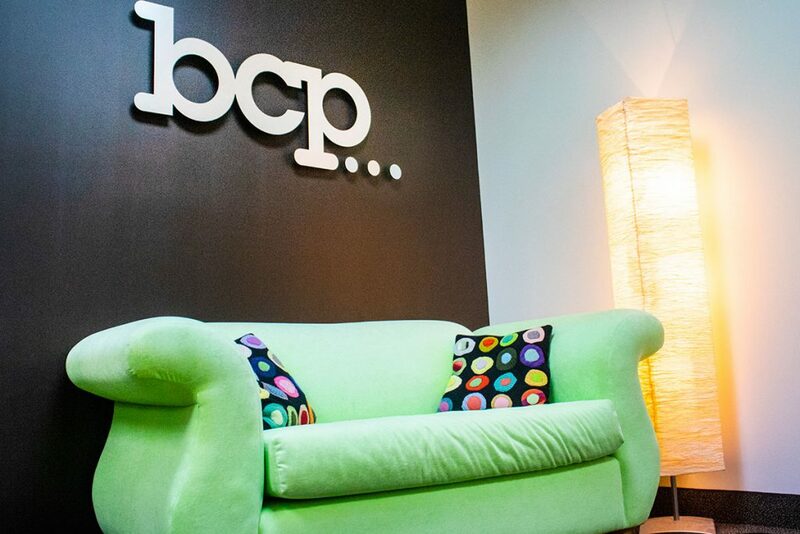 As we celebrate this year when #bcpturns25, we wanted to give you a peek into our wacky interior decorating style and a brief history of some of our most memorable pieces. Purchased from (I kid you not) funkysofa.com. When we moved into our current office space in the early 2000s, we decided we needed a couch that represented our playful, creative approach and fit in with our then newly redesigned brand (hence the green). Funkysofa’s website is still kicking all these years later. If you’re in the market for a green velvet loveseat, you can still buy the same couch here. Sitting on a shelf in our back conference room is our idea barn. 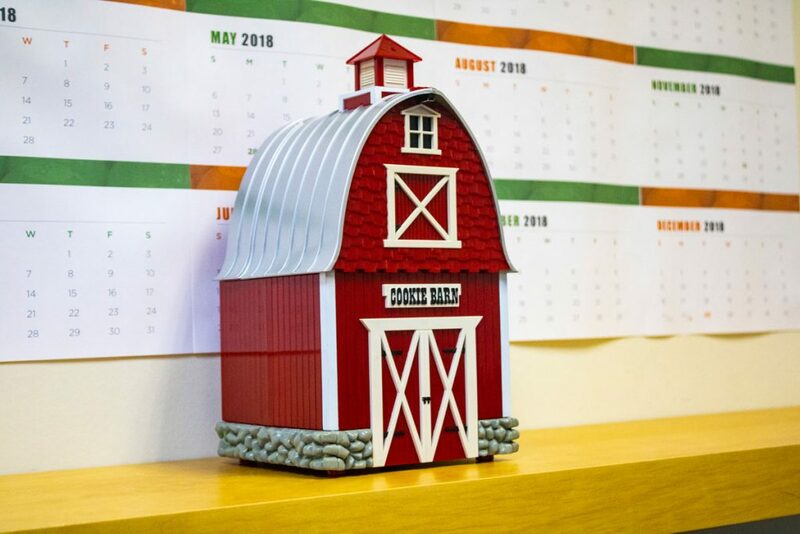 It was originally supposed to be a cookie barn (an office holiday gift from years gone by), but now we use it whenever we need to have a group brainstorming session. Fun fact: if you put batteries in it, it moos. One of our favorite parts of the office is our artwork. A number of pieces have been left behind by previous BCPers. Others are promotional pieces we’ve made to help visualize our brand. Some are just fun works that have been picked up over the years. And some are made from garbage. One sculpture we have in our back conference room looks like a piece of modern art, but is actually just leftover packing tape from when we first moved into our office. 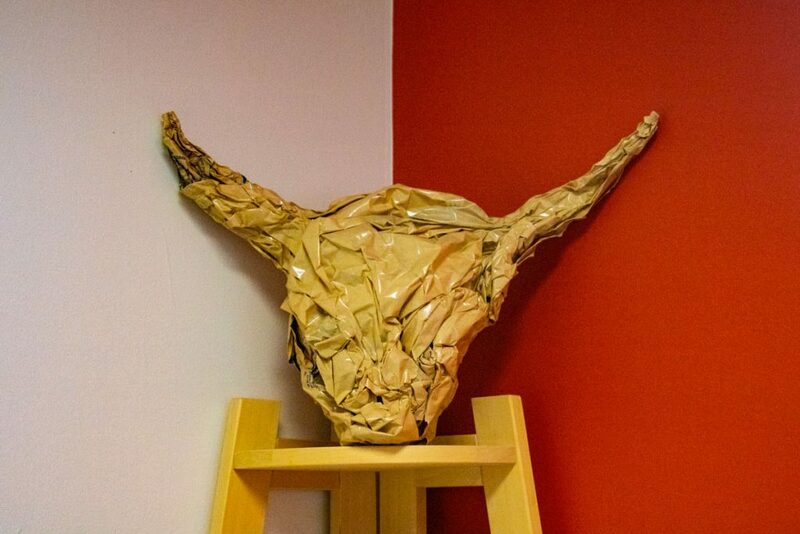 Owen, one of our designers, crafted the leftover tape into the shape of a bull’s head. The custodial staff thought it was too precious to throw away. We agreed. It’s held a place of honor on the back shelf ever since. 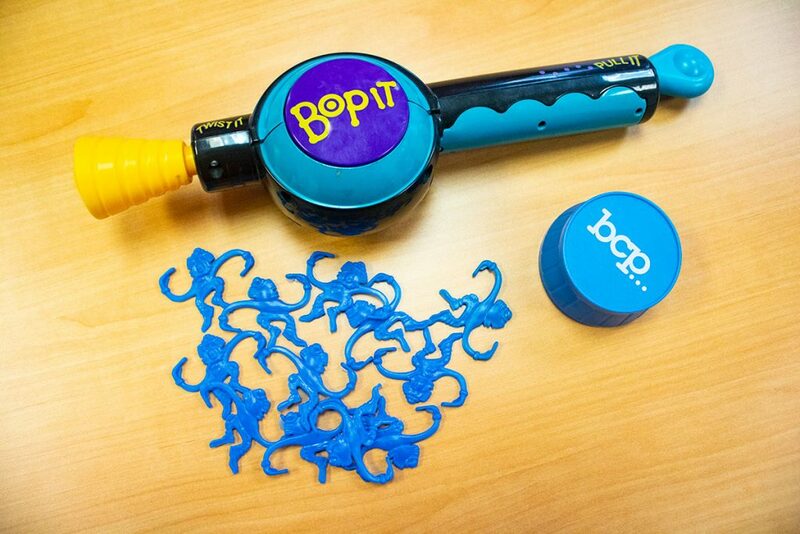 One day, you may walk in to find us in a fierce game of Bop It!, trying to help each other get the ping pong ball shooter to work right, or squashing silly putty between our hands while we try to work through our latest creative challenge. Our toys help us stay humble, flexible, and creative and help us remember to not take ourselves too seriously.